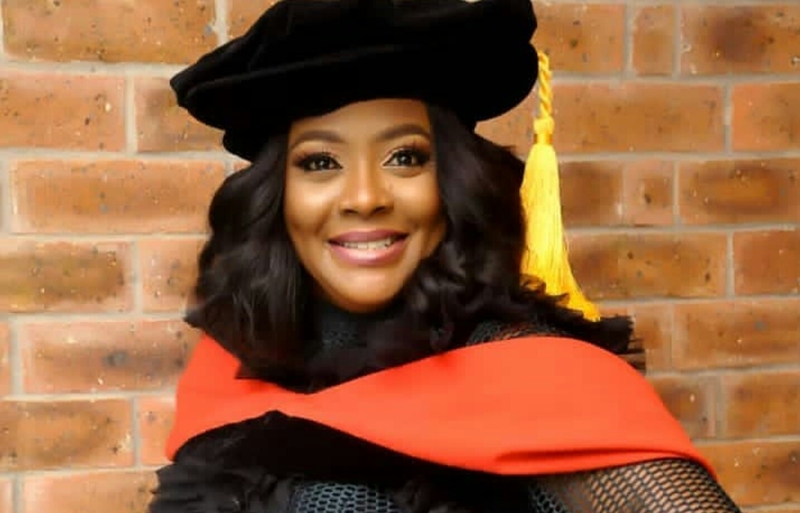 Yes, this is no joke, popular Multi talented Comedian and actress, Helen Paul, has acquired a doctorate degree from the University of Lagos. The 41-year-old renowned OAP who is popularly known as Tatafo in her various comedy skit on IG and radio stations has revealed her excitement at being the first Nigerian stand-up comedian to bag a Ph.D.
"Can't wait to wear my beautiful gown on Thursday. To my husband, papa thank you for your encouragement, your words are sweet ( do it jor, babe face that fear, i can't wait to see a doctor as my wife every morning). You are all invited to the University of Lagos as my convocation is on the 4th of April. (Positive minds only) @officialbunmidavies thank you for all the free food, my room mate is also grateful and now we are missing our rooms. (Back to the wife and mummy duties fulltime) POST DOCTORATE NEXTTT!!!!!" She also thanked her supervisor and husband for all their support during the process adding that her convocation was next week Thursday, 4th of April.